Learn all about how Doctor Strange’s friend-turned rival figures in! Mordo vaults off the silver screen and into “Marvel Puzzle Quest,” bringing all his formidable mystical artifacts with him. How does he fit on your team? Can he go toe to toe with Doctor Strange? We talked to D3 Go! Producer Josh Austin to get the lowdown on just what this wayward sorcerer’s capable of. Marvel.com: Baron Mordo’s an interesting choice for the “Marvel Puzzle Quest”-verse. We don’t have a ton of magical heroes in “Puzzle Quest,” so I’m super happy to see him making an appearance! Marvel.com: Mordo’s abilities in the comics and the film, at least to me, don’t seem super defined. How’d the team go about creating three specific powers for the mystic in “Puzzle Quest”? Josh Austin: The powers for Mordo were created based on key moments from the Doctor Strange movie, including the staff artifact he shows Doctor Strange when explaining how they chose the sorcerer. We also focused one of his abilities in a similar fashion to the way Mordo is able to run through the air to smack Doctor Strange, showing him how slowly he’s learning. The last power focuses on what he shows the audience at the end of the credits but I won’t spoil it for you if you haven’t seen the movie yet. Marvel.com: Let’s talk about what Mordo’s got going on under the hood. Let’s break down his abilities. Josh Austin: Mordo’s first power is called Staff of the Living Tribunal and it costs seven Black AP. So like the staff in “Doctor Strange,” the staff starts solid and separates into a type of chain whip. This attack deals damage, then converts Black basic tiles to Charged tiles. If there are enough Black Charged tiles on the board, the attack deals damage for each Black Charged tile on the board then destroys them, so at level one if there are six Black Charged tiles it will do 54 damage per Black Charged tile on the board. At level five it gets even better, where if there are three or more Black Charged tiles each one will deal 454 damage to the enemy team for each Black Charged tile on the board then it destroys the Black Charged tiles. His second power is called Vaulting Boots of Valtorr and costs 10 Blue AP. For this power Mordo takes to the air, striking his target for damage and converting basic tiles of the enemy’s strongest color into Black Charged tiles. Using this power helps generate Black Charged tiles for Staff of the Living Tribunal. Mordo’s last power is called Power with Purpose and costs nine Purple AP. This power focuses on Mordo’s ability to steal from an unworthy sorcerer, so for this power he stuns the target and steals Blue AP. This power feeds into the Vaulting Boots of Valtorr power to help bring the player’s Blue AP up and at higher levels will steal Purple and Black AP as well. Marvel.com: Mordo feels like a hit-and-run aficionado, ready to stun, steal AP, do some damage, and get out. That fair to say? Josh Austin: That definitely fits with the Mordo we leave the Doctor Strange movie with and is a big part of the planned design for this variation of Mordo in “Marvel Puzzle Quest.” Overall his health is pretty good and the player wants to focus on Black Charged tile creation to hit the opponent with as much damage as they can with Staff of the Living Tribunal. Marvel.com: I feel like Mordo could find a place on just about any team, but is almost entirely self-sufficient at the same time. Is there anyone in particular that he synergizes well with? 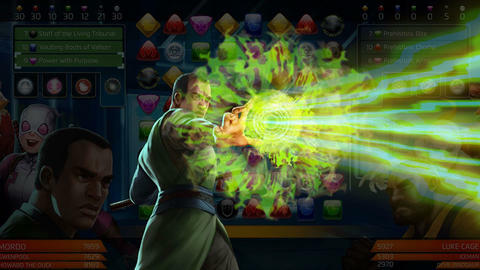 Josh Austin: The player will want to create Black Charged tiles as much as possible, so using characters that can help give Mordo more Purple and Blue to use his powers to generate more Black AP can help characters like Scarlet Witch’s passive to create Purple or Iron Man Model 40 to create three Red and Blue AP. Another option would be to use Silver Surfer’s Perfect Being power to create Charged tiles, or just team him up with Thor (Goddess of Thunder) to take advantage of her ability Smite to do extra damage with charged tiles on the board. Marvel.com: And when do we get to test out Mordo’s mystical artifacts for ourselves? Josh Austin: The release of Mordo continues the celebration of Black History Month in “Marvel Puzzle Quest” as we recently released Black Panther (Civil War) and Riri Williams (Ironheart) in the game. We are all happy to see both Black Panther and Riri featured right now on the “Marvel Puzzle Quest” game loader for everyone to see when the game is launched. Players interested in adding Mordo to their roster can find him available in-game starting tomorrow, February 9, in the Unstable Iso-8 event between February 9 and February 14. He will also be the new featured character in the Strange Sights event between February 13 and 17 and is a progression reward and in the event Vault. And finally, his very own Versus Tournament called Too Many Sorcerers will start on February 16 and end on February 20. Pick up Mordo and put on your blue suede flying shoes here, and stay tuned to Marvel.com for more “Marvel Puzzle Quest” news and interviews.